The Soul Kitchen promoted many gigs in the early 80s featuring, among others, Scottish bands from the Postcard label, and upcoming local ats such as Prefab Sprout and Hurrah! 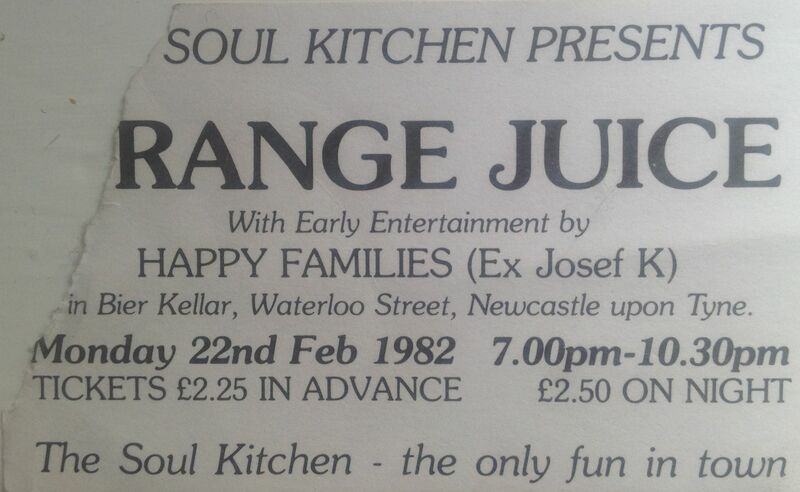 Soul Kitchen was a moving night club, with took up residence at various venues around Newcastle. It also spawned Kitchenware records which currently has Editors, Prefab Sprout and others on its rosta. This gig was by Orange Juice, and was held at the Bier Keller, which was, as the name suggests, a German style beer house in the 70s (and the scene of lots of drunken nights). It later became Dingwalls and then Rockshots. Orange Juice came from the Postcard stable, and were on the brink of chart success at the time of this gig. This gig was before they released their second album “Rip It Up”, and the single of the same name, which was a hit in the following year. I’m sure I remember also seeing them at the time of “Rip It Up”; I think I went to see them again in the same venue the following year, by which time the Bier Keller was Dingwalls. What I do recall is a great jangly pop band who moved closer to disco/funk and added deeper bass and synth; particularly on “Rip It Up”. Line-up: Edwyn Collins – guitar, vocals; Malcolm Ross – guitar; keyboards; David McClymont – bass guitar; Zeke Manyika – drums.